The people behind the PlayStation have been proudly promoting their 3D wares throughout the year, but today at Sony Pictures Studios in Culver City, California, Sony brought some of its biggest guns, as executives presented its new technology push. Top Sony executives Sir Howard Stringer (CEO and President), Stan Glasgow, (Chief Operating Officer), Michael Fasulo, (Chief Marketing Officer) and Jack Tretton (President and CEO of Sony Computer Entertainment of America) all slipped on 3D glasses as they watched presentations from ESPN, the Discovery Channel and Sony's own internal divisions. This meant visually dazzling the crowd with teasers for new movies like Men In Black III, Blu-ray releases like Cloudy With A Chance of Meatballs and video games like Gran Turismo 5, WipEout and MLB The Show 10. Presented on Sony's own 3D-ready digital projectors, scenes of college football games and Sony's computer animated films were impressive. "When it comes to good versus mediocre 3D," Sir Howard Stringer told the audience, "you know the difference, Sony knows the difference. Good 3D is immersive, not jarring. It fuels the imagination and is easy to watch." Stringer says his company is "listening closely to what our consumers have to say about 3D," while in the midst of launching new 3D Bravia televisions that run from $2000 USD to $5000 USD. That high price and some of the technology caveats named by Sony COO Stan Glasgow couldn't dampen the executives' enthusiasm for their flood of 3D goods. Sony hopes that consumers will catch 3D fever with the same type of programming that helped push HD television, including sports coverage, Discovery Channel documentaries and video games. Sony Computer Entertainment America president Jack Tretton boasted that his company's PlayStation 3 was the "perfect delivery system" to bring that content home. 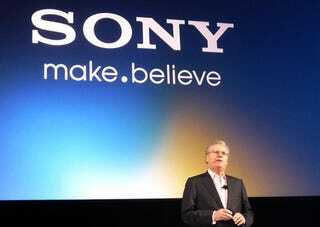 Sony has sold 35 million PlayStation 3 consoles, Tretton says, and plans to sell 50 million by March of next year. The device is about to receive a firmware upgrade that will let it play 3D Blu-ray movies and video games. "As you know, PlayStation 3 played a major role in establishing Blu-ray as the high definition standard for this generation," Tretton said. "What PlayStation 3 did for Blu-ray, we're now prepared to do for 3D." "3D gaming is most anticipated technology for the home to arrive on the market this year," Tretton claimed, adding "PlayStation owners are the true early adopters when it comes to cutting edge technology." He cited research that indicated that PlayStation 3 owners were more likely to have their consoles connected to HDTVs and surround sound set ups than the console's competitors, the Wii and Xbox 360. Sony's banking big on that adoption, with 20 games coming in stereoscopic 3D to the PS3 in the company's next fiscal year. Some are 3D updates to existing titles, like Motorstorm: Pacific Rift and PAIN, while others are still to be released, like Killzone 3 and the motion-controlled brawler The Fight: Lights Out. Tretton said that the company will announce more specifics on its 3D line-up at E3 2010, happening next week. Early adopters who buy one of Sony's 3D Bravia sets will get two free downloadable games and two free demos for the PlayStation 3 that will showcase the stereoscopic 3D capabilities of the console. And if that's not enough to convince consumers to jump into the 3D space, Sony's Michael Fasulo says the company will spend $100 million advertising its range of 3D products, from its TVs to its handheld video cameras to its dedicated Blu-ray players. After Sony's event, I got a chance to play two of its new 3D PlayStation 3 games, MotorStorm: Pacific Rift and WipEout HD Fury. Both were great 3D technical demonstrations, with the exception of the odd, unsettling visual hitch. Along with its PlayStation Network shooter Super Stardust HD, the two PS3 racing games were some of the better 3D gaming experiences I've enjoyed. Pacific Rift was the most impressive of the bunch, offering, in 3D, a better look at distant portions of the track. WipEout HD Fury flowed smoothly, presenting a spectacular sense of depth. Both had their share of distractions, perhaps the product of playing them for little more than five minutes each, my eyes still untrained to the pseudo 3D style. With Sony's upcoming giveaways, its massive investment in advertising and 3D video game development, and a push from broadcasters like ESPN 3D—which launches officially later this week on providers that include Comcast, DirecTV and AT&T—it's clear that the company is serious about its plans to lead the pack in 3D. Update: A previous version of this story listed SOCOM 4 as one of the 3D titles on display at Sony's 3D demonstration, which was posted in error.